We are all time-rich and sometimes results-poor. What is your most basic resource? According to most surveys, we have more tasks and less time to do them than ever before. Most of us know this. We feel like we’re drowning in an endless stream of time deadlines. 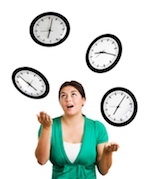 How many times has this time management faux pas happened to you? After groggily waking up, you get ready to start your day and sit down at your computer with a steaming cup of fresh-brewed coffee. 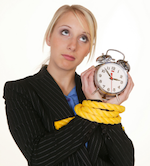 Have you ever reached the end of the day and wondered what happened to your time management? Here’s the big mistake that most people make that leads to not much being accomplished. You decide you haven’t been as efficient as you could be, so you decide to take charge. So, you open your calendar (or grab a pen and planner if you’re old school), and get to work setting up a new system. 30 minutes later, what you have isn’t a better grasp on your time, but rather a messy calendar with overlapping time slots that’s all too difficult to read. If you’re like most entrepreneurs, you work long hours to pursue your dream. But you can’t work long hours forever. You need to have a plan in place that sets clear goals about reducing your work time—while simultaneously increasing your wealth, happiness, and freedom. Ok, don’t panic; this doesn’t require any hard work. I’m going to give you a step-by-step plan you can follow. And you can do this in 10 minutes on a notepad. Jim and I were talking the other day. He was grumbling because it’s the end of the year. He’s worked very hard. * Put in too many hours at the office. * Put too many miles on his car. * Spent too many nights in hotel rooms. And didn’t spend enough time with his family. To top it off, he didn’t hit his sales or financial goals. Tom was ecstatic. On top of the world. After trying to reach Steve for the past month he finally got through and scheduled an appointment for Tuesday morning at 10:00am.